Book of the Month for August – Books that have Pictures, but No Words! Last month we featured a book with NO PICTURES, but this month we’re turning things upside down and looking at books with LOTS of pictures but NO WORDS! Did you know that oral story telling skills are really important for development of literacy skills and for building complex language skills that contribute to the development of complex thinking skills? Wordless story books are a fantastic way to develop and broaden your child’s imagination and oral storytelling skills. These books tell stories just through pictures (no words at all!) which means you can have a completely unique experience each time you ‘read’ the story together. The language we use when we tell stories is quite different to, and often more formal than, the language we use when we have a conversation. Telling stories naturally brings about opportunities to introduce a number of important pre-literacy and higher order language and thinking skills. You can find some great wordless story books by clicking here. 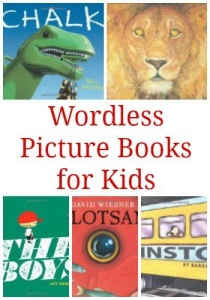 You might also like to ask your therapist to show you some of their favorite wordless story books at your next session or pop into your local library and see what you can find. Stories can be read, written, told and listened to – they can be about anything you like! Think of some ways you can start a story with your child, many begin with ‘once upon a time’ but can you think of other ways to open the story and set the scene? You could even turn your story into your own wordless picture book by drawing pictures that tell the story and stapling them together into a book, or by using the ‘Book Creator’ app on your phone or tablet for a more ‘high tech’ version – this app even lets you record your voice with each picture so you can listen back to your story again and again! Does the story need to include any new vocabulary for your child? If you do encounter new words, make a note of what they are and spend some time learning what they mean by giving your child an explanation of the word, drawing a picture of what the word means, looking the word up on the internet, having an experience with the word and talking about words that mean the same thing (or similar) or words that mean the opposite. Can you tell the story with more detail by adding in adjectives and adverbs? Adjectives tell us more about a noun e.g. ‘the car’ becomes ‘the big blue car’) and adverbs tell us more about a verb (e.g. ‘the car drove quietly into the street’. How will you join up the ideas in your story? Initially your child might tend to join up stories with coordinating conjunctions like ‘and’ ‘or’ ‘so’ ‘but’ ‘and’ ‘then’. As they develop their story telling skills you can start model and prompting them to add more complexity to their sentence structure by using some subordinating conjunctions like ‘after’ ‘because’ ‘if’ ‘before’ ‘although’ ‘though’ ‘unless’ ‘until’ ‘when’ ‘since’ ‘so that’ and correlative conjunctions like ‘or’ ‘either’. Some parts in a story are in the voice of the story teller or ‘narrator’ while others are the characters speaking themselves, can your child change their voice to match the register of the character? Can they make their voice sound as if it were an animal that was speaking? Can they change their voice to sound older or younger? Can they use their voice to show the emotion or real intention behind what is being said? Explore how changing the way you tell the story can change the meaning of the story, and how different characters use words in different ways (e.g. a child uses different words and a different register when talking to a friend in the playground than when talking to a teacher in the classroom). Remember, listening is a bridge to language and language is a bridge to literacy. Until next month, happy storytelling!